Basic and clinical aspects are discussed by expert contributors in this book devoted to stimulating further studies and developing new therapies for pulmonary fibrosis. Current laboratory and basic findings are reviewed in the book's first 19 chapters, while clinical aspects are addressed in the remaining 16 chapters. These aspects include laboratory and bronchalveolar findings, diagnosis, treatment and prognosis of idiopathic pulmonary fibrosis, collagen disease lungs, sarcoidosis, pneumoconiosis, hypersensitive pneumonia, drug-induced pneumonia, ARDS, radiation pneumonia, BOOP, viral pneumonia, and other diseases causing pulmonary fibrosis. The roles of various cytokines, viral infection, and lung injuries in the development and pathogenesis of pulmonary fibrosis are discussed. The definition, classification, and lung functions of pulmonary fibrosis are included as well. 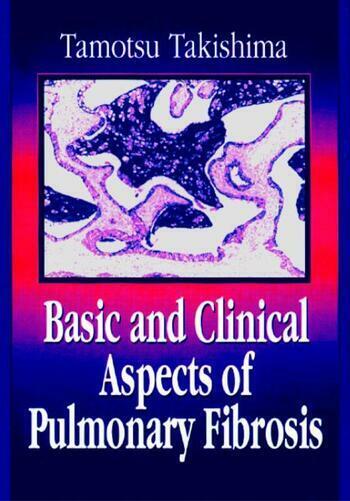 Basic Part: The Pathology of Pulmonary Fibrosis by the Study of Paraquat Lungs (T. Takahashi). Immunohistochemical Analysis of Interstitial Lung Disease (Y. Fukuda). Ultrastructure of the Lung in Health and in Fibrotic Diseases (O. Kawanami). Role of IL-1 in Pulmonary Fibrosis (F. Ogushi, S. Sone, and T. Ogura). Role of Interleukin-2 and Interleukin-2 Receptor in Farmer's Lung (K. Konishi, Y. Ninomiya, T. Mouri, and Y. Kojima). Platelet-Derived Growth Factor Production by Alveolar Macrophages (I. Nagaoka and T. Yamashita). Role of Fibronectin in the Pathogenesis of Idiopathic Pulmonary Fibrosis (K. Yamauchi). Proliferation of Alveolar Macrophage (K. Nakata). Cytokine Production by Human Alveolar Macrophages and its Regulatory Network (S. Sone and T. Ogura). Differentiation of Alveolarmacrophages Stimulated by Various Cytokines in Fibrosing Lung Diseases (K. Katoh, T. Kawai, K. Matsunaga, K. Tani, and T. Okubo). Effects of Heparin and FGF on Pulmonary Fibroblasts and Vascular Cells (Y. Mitsui, Y. Yamashita, K. Amanuma and M. Kobayashi). Role of Laminin in Pulmonary Fibrosis (K. Satoh, T. Sakai, and S. Shindoh). Insulin-Like Growth Factor-1 in Pulmonary Fibrosis (T. Nukiwa, S. Homma, and S. Kira). The Cell Adhesion Molecules and Pulmonary Fibrosis-A Proposal from Pathological Examination (H. Ohtani and N. Andoh). Molecular Pathogenesis of Influenza Virus Pneumonia: Impacts of Proteases, Kinins, and Oxygen Radicals Derived from Hosts (T. Akaike and H. Maeda). Interstitial Pneumonia in Human T-Cell Lymphotropic Virus Type-I Infection (M. Sugimoto, F. Imamura, M. Matsumoto, S. Mita, I. Cho, and M. Ando). Lung Injury by Active Oxygen (C. Tsuji and H. Nakazawa). Steroid Receptor in Pulmonary Fibrosis (T. Okabe and M. Fujisawa). Viscoelastic Properties of Alveolar Wall in Pulmonary Fibrosis (K. Takahashi). Clinical Part: Definition and Classification of Pulmonary Fibrosis (T. Takishima and S. Shimura). Pulmonary Functions of Idiopathic Pulmonary Fibrosis (H. Sasaki, S. Shimura, W. Hida, Y. Kikuchi, K. Sekizawa, and T. Takishima). Control of Breathing in Pulmonary Fibrosis (Y. Kikuchi). Bronchoalveolar Lavage (BAL) Findings in Patients with Idiopathic Pulmonary Fibrosis (IPF) (S. Nagai, N. Satake, T. Shimoji, T. Tsutsumi, T. Mio, S. Tanaka, M. Takeuchi, and T. Izumi). Management and Treatment of Idiopathic Pulmonary Fibrosis (T. Izumi and S. Nagai). Prognosis of Idiopathic Pulmonary Fibrosis (S. Shimura and T. Takishima). Lung Manifestation of Connective Tissue Disease (R. Kasukawa, F. Sakuma, and M. Saito). Pulmonary Sarcoidosis (E. Yamaguchi and Y. Kawakami). Pulmonary Fibrosis Due to Inhaled Inorganic Dusts (M. Kido and T. Tsuda). Hypersensitivity Pneumonitis (M. Ando). Drug-Induced Pulmonary Damage (T. Abe, K. Satoh, and M. Motomiya). Adult Respiratory Distress Syndrome and Adhesion Molecules (S. Hashimoto and T. Horie). Radiation Pneumonitis (Y. Nambu and N. Ohya). Bronchiolitis Obliterans Organizing Pneumonia (BOOP) (M. Kitaichi). Pneumonitis Caused Viruses and Pneumocystis carinii (S. Kitamura and J. Kobayashi). Rare Diseases Causing Pulmonary Fibrosis (M. Yamakido and S. Ishioka).